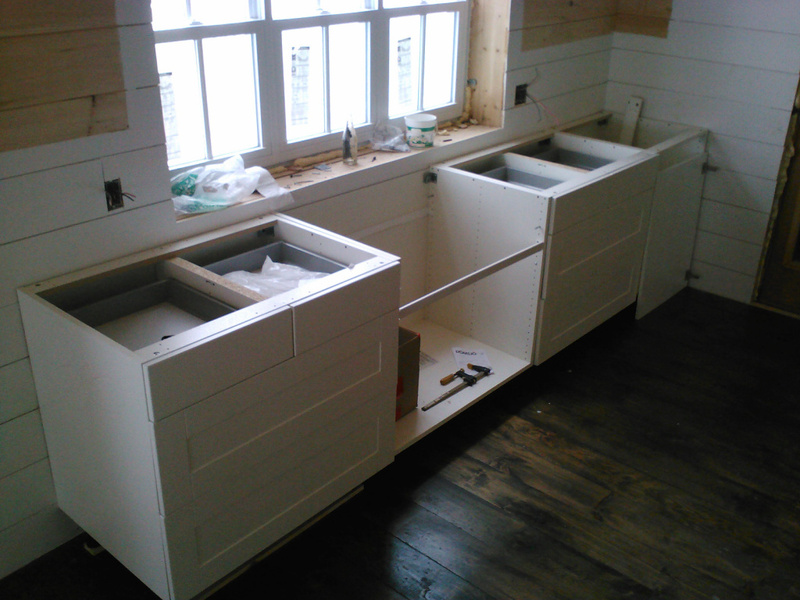 Andrea mentioned the island in the last post & included a picture with placeholder cabinets. A drain pipe had already been installed. Since there wasn’t a spot in the existing cabinet arrangement for a dishwasher, we concluded that’s what the island drain was for. While planning the island design I kept in mind that the cabinets would essentially be freestanding. Secondly, the location of the drain was such that the dishwasher couldn’t really be installed at the end of the island. The design I came up with was to have the dishwasher between two cabinets that were facing the ends of the island. There wasn’t a wall to anchor the cabinets to so I built a frame anchored to the floor for the cabinets to back against. There will be a small set of shelves behind the dishwasher but I won’t add those until it has been plumbed and wired. These cabinets and range are along the west wall of the kitchen. The front door was behind me. 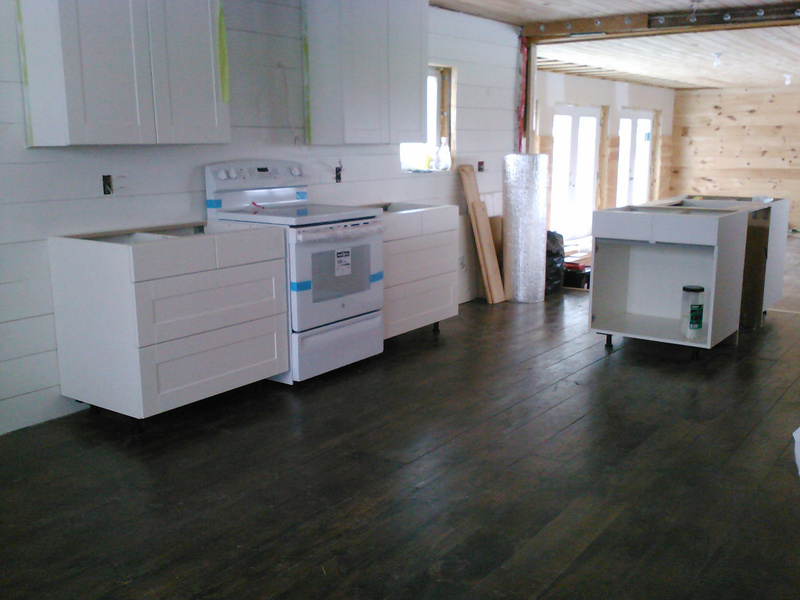 The upper cabinets on either side of the space for the electric range had been installed but the lower ones had just been pushed approximately in place. I hadn’t realized that right away and was happy when I discovered it. We bought the range and dishwasher months before we needed them so that we could position the cabinets around them. As it turned out, one of the counter outlets didn’t have a wire that went to the electrical panel. Pulling that wire was easier because the cabinet was mounted to the wall. All the kitchen cabinets are now levelled & anchored in place. The next task will be templating for the countertop. The windows face south east. On a sunny morning the kitchen is nice & bright. There is nothing more homey than a sunny kitchen. Looking good!